At the invitation of the Government of China, ESCAP Executive Secretary Ms. Armida Salsiah Alisjahbana had an official visit to Beijing, China from 14 to 15 January 2019. Ms. Alisjahbana met with Executive Vice Foreign Minister Mr Le Yucheng and Assistant Foreign Minister Mr Zhang Jun, Vice Minister of Commerce Mr Wang Shouwen, Minister of Transport Mr. Li Xiaopeng, Administrator of the National Energy Administration Mr Zhang Jianhua, Vice Minister of Agriculture Mr Qu Dongyu, Vice Chairman of China International Development Cooperation Agency Mr Zhang Maoyu, and senior officials from the National Development and Reform Commission. She also met with the UN Resident Coordinator Mr. Nicholas Rosellini and the Special Representative of the UN Secretary-General for Disaster Risk Reduction Ms. Mami Mizutori. 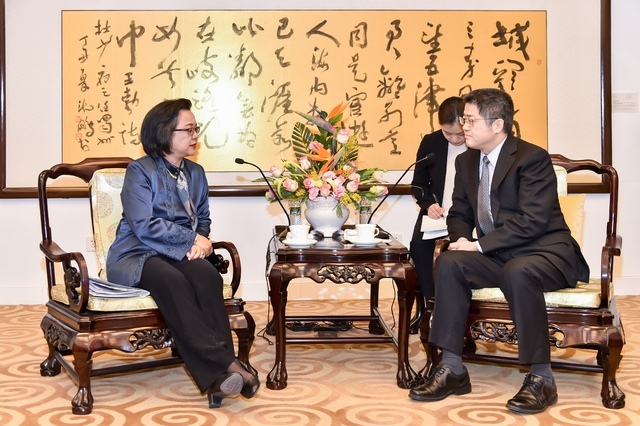 As her first official visit to China after she assumed office, Ms Alisjshbana expressed her appreciation to the Government of China for its strong support to ESCAP. She recognized the important role China plays in achieving the 2030 Agenda for Sustainable Development and shared her priorities to promote regional cooperation through multilateralism as well as to work together with member States in enhancing sustainable development and prosperity in the Asia-Pacific region. During her visit, the Executive Secretary also signed an agreement with Energy Foundation (EF) to boost low carbon and sustainable energy targets in the Asia-Pacific region. Under the memorandum of understanding, ESCAP and EF will work together to support Asia-Pacific countries in accelerating implementation of the Sustainable Development Goals (SDG) 7 and 13 as well as the Paris Agreement targets. Both organizations also agreed to jointly promote opportunities to develop sustainable energy in Asia and the Pacific.